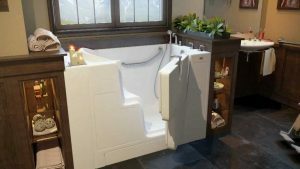 Whether your goal is increased safety or you simply want the best aging-in-place option available, a walk-in tub can provide the type of bathing experience you are hoping for. If you live in the Louisville, Kentucky, area, then Compozit Home Systems can help you choose the perfect tub for your needs and install it in as little as a single day. We’re a family-owned and locally operated business that has been serving homeowners throughout the area since 1982, and our commitment to providing a satisfying customer experience has helped us maintain an A+ rating with the Better Business Bureau for many years. And, every Hydro Dimensions walk-in tub we install comes with a lifetime limited warranty to give you added peace of mind about your purchase. In addition to walk-in tubs, Compozit Home Systems also offers bath liner systems and exterior remodeling options including replacement windows, entry doors, siding, and more. Contact us today if you would like to schedule a consultation at your Louisville-area home to discuss walk-in tub installation. Convenient financing options are available.